Hospitals and healthcare organizations must actively protect their endpoints against ransomware attacks. Ransomware is a type of malware that infects computer systems, restricting users’ access to the infected systems, and attempting to extort money from victims by displaying an on-screen alert. 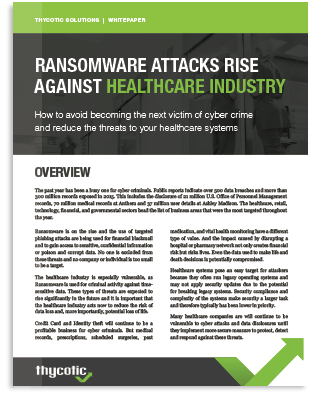 In our free whitepaper you’ll learn how your hospital or healthcare organization can gain protection by eliminating ransomware’s ability to install on your network—keeping your healthcare systems running so your healthcare teams can make time-sensitive health decisions for your patients. Join Thycotic Product Marketing Manager Joseph Carson as he explains how specific application control solutions along with other endpoint lock down security can help you apply a “least privilege” strategy to protect your systems from ransomware and other targeted attacks. Discover why more than 10,000 companies worldwide, including Fortune 500 enterprises, rely on Thycotic for privileged account management, endpoint protection, and security.